1 In a large bowl, combine the sour cream, soup, chilies and olives. Set aside 1-1/2 cups for topping. 2 Add the chicken, 2 cups Monterey Jack cheese and 2 cups Cheddar cheese to remaining soup mixture, mix. 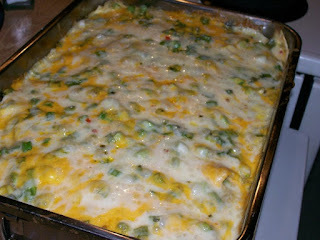 3 Spoon about 1/2 cup chicken mixture down the center of each tortilla; roll up tightly. Place seam side down in a greased 13-x9x2-inch baking dish. Top with reserved soup mixture. 4 Bake, uncovered, at 350 degrees for 40 minutes. 5 Sprinkle with remaining cheeses; top with onions (I put the onions on first since I wanted more onion flavor in the enchiladas and then cheese on top, the onion mixed in with the cheese great as you can see in the picture). 6 Bake 10-15 minutes longer or until cheese is melted.